Bing Translation is a cool service for quick translation of text and webpage from one language to another. It has added Hebrew language in the list of supported languages. 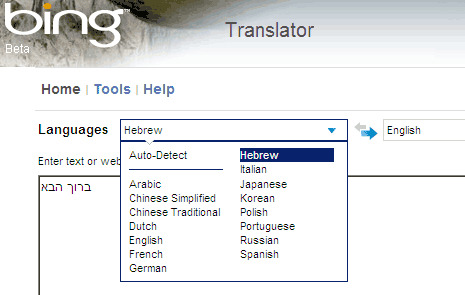 Now you can translate to and from Hebrew language online using Bing Translate service. While on Bing Translate, select Hebrew as TO or FROM language and type text or URL of specific webpage. Click the translate button to see text in translated language. If you want more quick language translation, try instant translation on Bing Search or grab the Bing translation widget for your website or blog. The term “Live” is not suitable for machine translations. For a free human translation you should go to live-translator.net and ask a volunteer to translate your text.